I love the month of February as I think we can all use more times in our lives to show our love for our family & friends in different ways. So often we can get so busy in our daily lives that we don’t take the time to express what we love about those people in our lives that we care the most about. Valentine’s Day to me is about doing thoughtful things for each other to show you care, not about giving fancy flowers, chocolates or gifts. And yes, this should happen all year long, not just at Valentine’s Day . My friend, Bethany, shared an idea that she is doing in her family for the month of February and I loved the idea, so I asked her if I could share it with all of you. It won’t cost you a thing as you can use supplies you already own, but a very special way to celebrate Valentine’s Day with the ones you love. 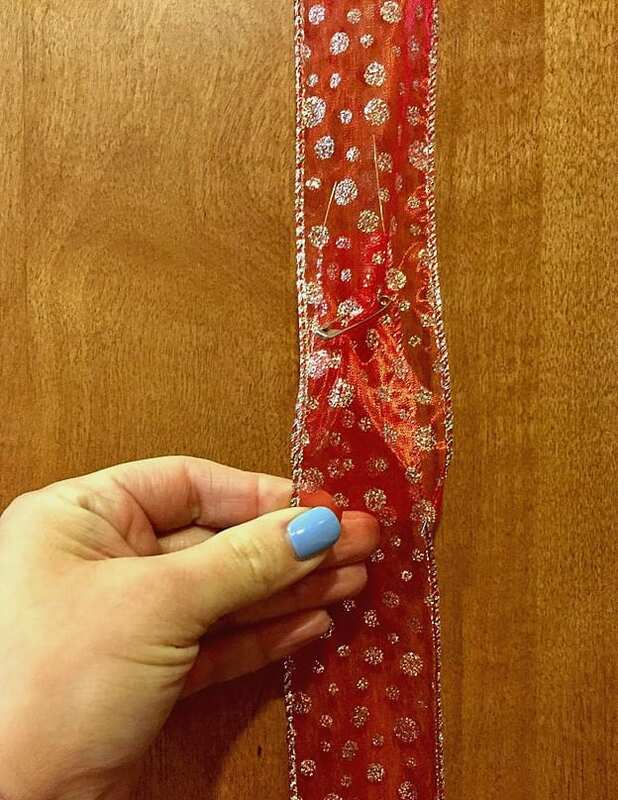 Many of you may have seen the idea going around to put heart notes on your child’s door for Valentine’s Day or the month of February. This idea is similar but you will make love notes for each of your kids or your spouse & kids and display them in your kitchen on ribbons. You could do this as a surprise for everyone to wake up to on Valentine’s Day or do it for several days leading up to Valentine’s day. What I love about this idea is that the whole family can get involved. You can leave notes for each other and it’s in a prominent place in the home where you spend a lot of time, reminding each other of the ways you are loved. It also provides some simple decorations for Valentine’s Day, too. 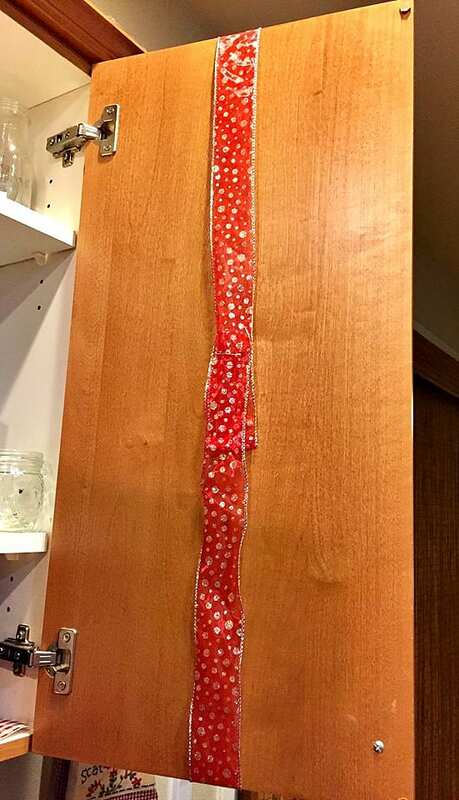 Take a roll of ribbon and wrap it around your cabinet door. Overlap it slightly and then either use a stapler or a safety pin (or even duck tape?) to secure it tightly on the inside of the door. Use the paper to cut out heart shapes and leave love notes for your spouse and kids. Attach the love notes to the ribbon with clothespins. 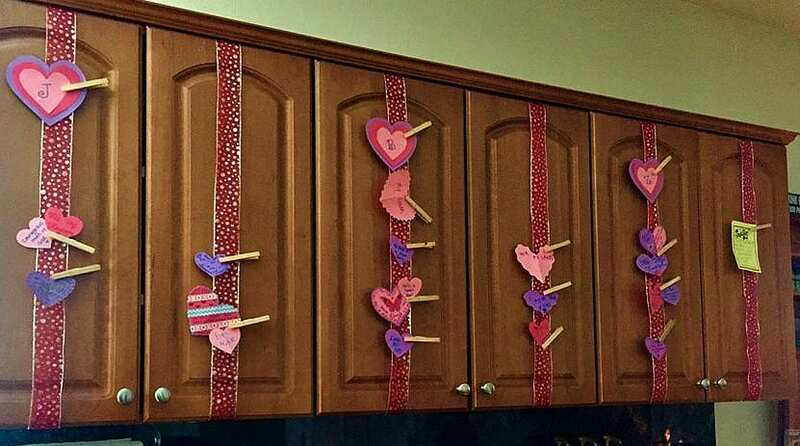 You could decorate the clothespins if you’d like by using colorful washi tape. I saw some fun Valentine colors of washi tape at the dollar store which would be an easy way to jazz them up. 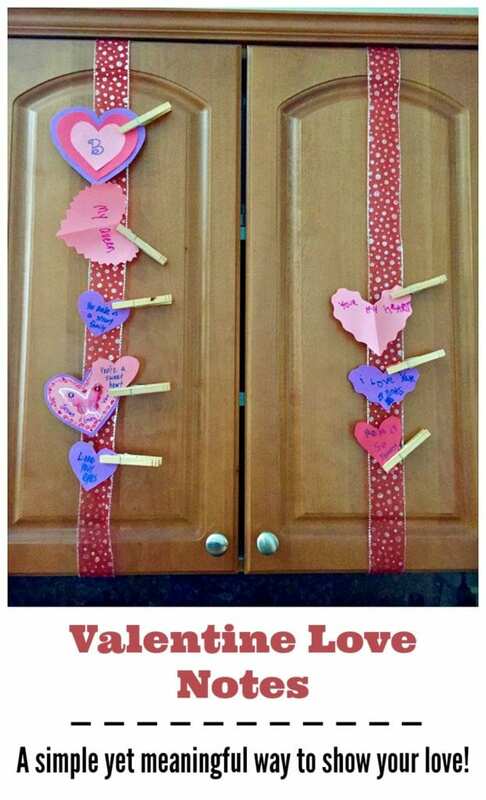 You could also use washi tape & then paper cut out into triangles to turn the clothespins into arrows, which would be appropriate for Valentine’s Day & cupid arrows holding up the notes. As you can see below, one idea is to have a separate ribbon for each member of your family so that they can know at a glance which love notes are for them. You can make hearts to hang at the top of the ribbon with that person’s initial or name. A way to make it easier for your family to participate & make more love notes for each other is to pre-cut out some paper hearts ahead of time. Put them in a basket along with a marker or sharpie (maybe crayons for the little ones so they can draw a picture) in the kitchen and then your kids or spouse can grab them at any time when the inspiration hits! It’s fun to find new notes that are randomly added at any point during the day as well. As you can see, this is a very simple, quick idea that could really make an impact on your family in showing how much you care & letting them know what you love about them. It’s fun to see that kids will also get into the idea as well, often leaving their own notes for you. In our family,we have little mailboxes from the Target dollar spot for each family member and we leave notes in the mailboxes each night to find in the morning. It’s fun to see my girls also start to leave notes as well for my husband and I or for each other. This idea really could be adapted to use at any time of year that you want to focus on giving encouragement and showing love to your family members. It could make a tough time of year a little easier to have these little reminders of how much they are loved. You can have fun & change up the shapes you use in the notes too if you want – using 4 leaf clovers for St Patrick’s Day, pumpkins for fall, etc. 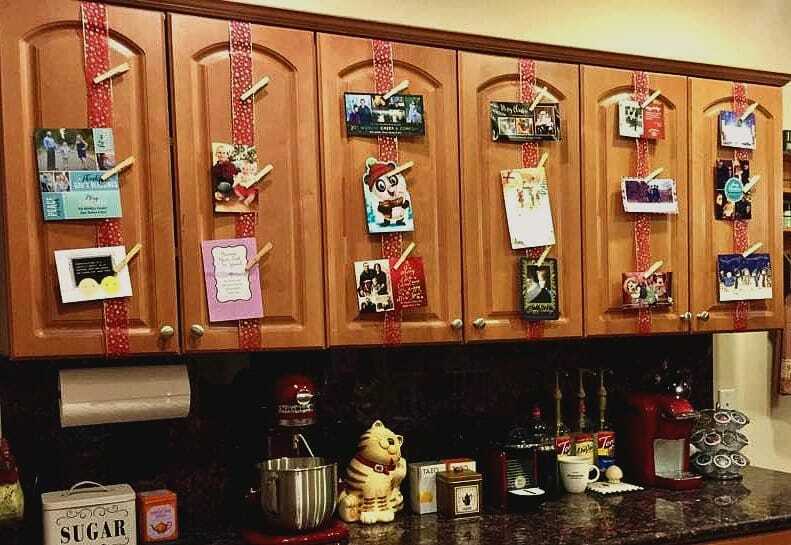 You can also use this same idea with the ribbon to display your Christmas cards – just attach your Christmas cards with clothespins as a way to see all the fun pictures and cards you receive throughout the Christmas season. We just keep our cards in a basket, but I like the idea of seeing the pictures of your family & friends spread out around your kitchen. I have friends who display their cards around their home and it’s a good reminder for them to pray for these families, too. Thanks to my friend Bethany who shared this idea and the pictures with us – check out her fun LipSense facebook page.